Jadon Sancho has exploded onto the German football scene in exciting fashion. Joining Borussia Dortmund at 17-years-old after turning down a mouth-watering contract with Manchester City, Sancho went in search of first team football over a season that would have likely resulted sitting on Pep Guardiola’s bench. 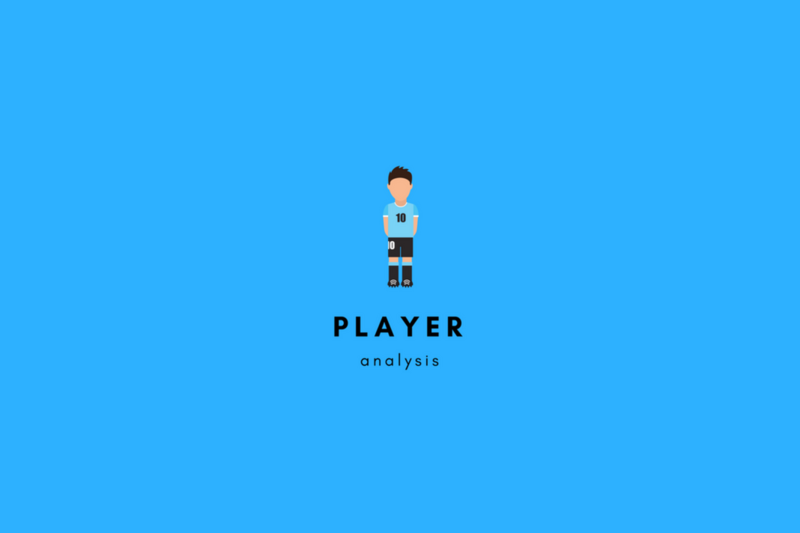 Playing in Germany has given Sancho the freedom to express himself without the added attention on the British press, something which has resulted in top England prospects stagnating in the past. Cameo appearances against Eintracht Frankfurt and Bayern Munich resulted in a first start for Sancho after the winter break and at just 17, Sancho became the first Englishman to start for Borussia Dortmund. His performances that game gave Dortmund fans something to shout about in what had been a dismal Hinrunde campaign under Peter Bosz. The hunger had been there for Sancho with the winger eager to impress not only his teammates, but his superiors. Performances continued at a high level for the remainder of the Bundesliga campaign with Sancho being the bright spark as Borussia Dortmund finished fourth. Given recent injuries within the England squad and a relatively ‘rookie’ looking World Cup squad, it’s a surprise that Sancho hadn’t been considered, as he can certainly offer something different to what England has seen before. Something we haven’t seen from England for a long time is someone who hugs the touchline and has the confidence to get past his man. On numerous occasions, we’ve seen Sancho do this in the Bundesliga with relative ease. 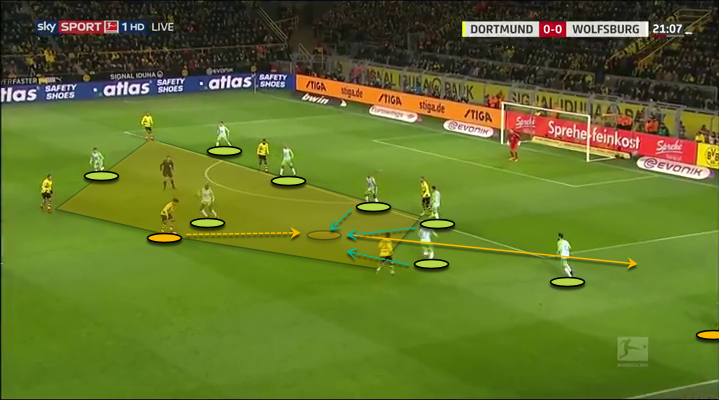 Under Peter Stöger, we’ve seen Dortmund play relatively narrow which isolates Sancho on the left, which can be seen below. In acres of space and in a 1v1 situation is the last place the opposing team wants to see Sancho. We see Sancho face up to his marker who’s backtracking while his ability to use both feet allows him to either go right or left in this situation. Whereas if you were 1v1 with Arjen Robben, everyone has the knowledge of what he likes to do. 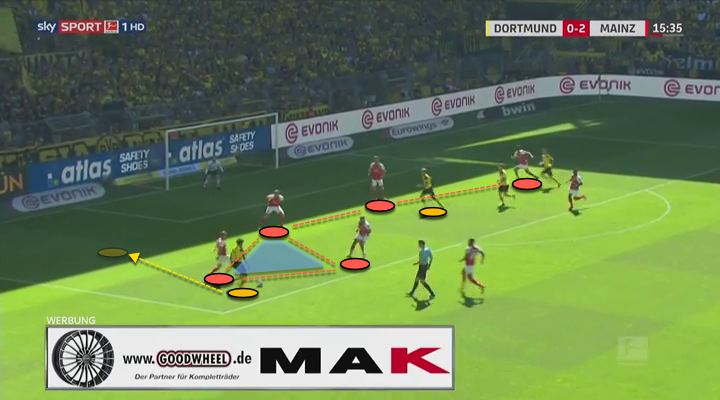 Mainz are set up well defensively here, but because Sancho is that dangerous and unpredictable on the ball, it draws three defenders towards the ball which allows Marco Reus more space on the edge of the six-yard box. Sancho cuts inside on his right foot but because he’s that fluid with both feet, he’s able to turn out and run towards the by-line, where he then finds Reus open to get Borussia Dortmund back into the game. The opposing team closing down Sancho is something we’ve seen on a regular basis. 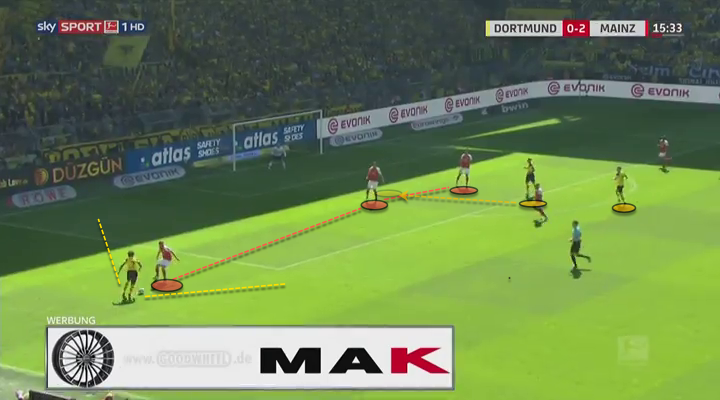 Here we find Sancho in a central position as opposed to out wide given Dortmund’s narrow attack. Before receiving the ball, Sancho already recognises the opposing defensive midfielder closing him down and before the ball is even at his feet, he knows he has the confidence to knock the ball past the onrushing Wolfsburg midfielder. Sancho then finds himself square on with the back four and again, the opposing team have taken up defensive positions relatively well. 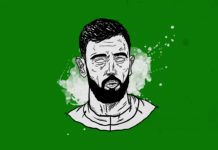 However, as soon as Sancho gets himself on the edge of the penalty area, Wolfsburg close the Dortmund attacker down with three players while Yunus Malli has lost Borussia Dortmund’s right-back, who’s crept in behind. It doesn’t result in a goal, but because Sancho has brought the opposing team with him, this creates the space for his teammates which can lead to a goalscoring opportunity. Sancho opened the scoring for Borussia Dortmund against Bayer Leverkusen with a well-taken goal. In the scene below, we see Sancho hold his position on the left, making the pitch wide and therefore difficult to defend. Bayer Leverkusen’s defence are too focused on the Dortmund attacker playing centrally whose aim is to break the offside trap, bringing Benjamin Henrichs with him. 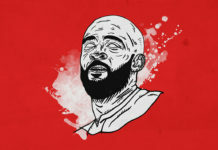 This allows Sancho to stroll into the penalty area unmarked and with time to lift his head up and pick his spot – reminiscence of a trademark Thierry Henry finish. It’s probably fair to say that many younger players in this position would lose concentration and cut inside as opposed to keeping the width, this is something Sancho does extremely well, linking back to the original point of isolating himself and creating a 1v1 opportunity. Again, we see Sancho holding position on the left. Already Werder Bremen find themselves with a 3v2 situation which isn’t great considering the ability possessed by Marco Reus on the right. 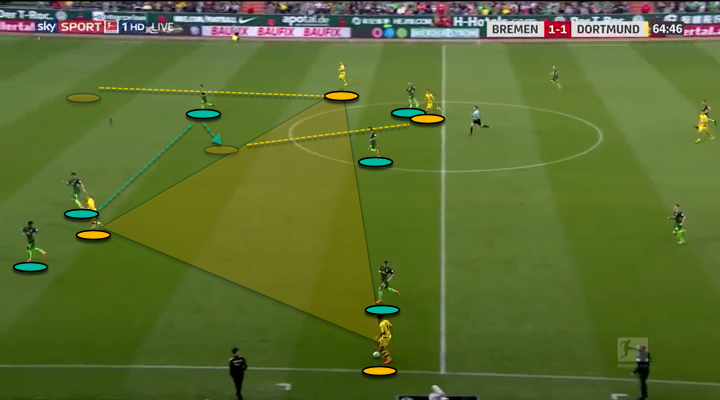 Below, we see that Bremen’s three-man defence has a gaping hole which will be exploited. 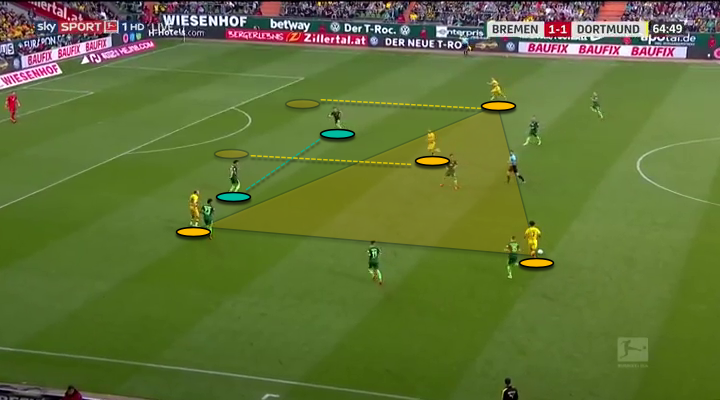 We see Maximillian Philipp attack the space in the middle, creating a 3v3 situation against a narrow Bremen defence. Sancho is able to shimmy and cut inside before releasing Reus who has found space, because of the run from Philipp, who’s looking to attack the offside trap in the middle. From this, Reus saw his effort strike the post but again it’s the ability of Sancho combined with the attacking movement from Dortmund that creates the scoring opportunity. In his Bundesliga debut, Sancho completed 14/16 dribbles and while his Dortmund career is still in the early stages, the statistics the now 18-year-old possesses are frightening. Completing the full 90 minutes in Dortmund’s last four Bundesliga fixtures, Sancho completed 8/10 dribbles (vs Bayer Leverkusen), 3/3 (Werder Bremen), 6/6 (vs Mainz) and 6/8 (vs Hoffenheim) while completing 87% or higher of his passes in those fixtures. Considering the stats and what Jadon Sancho has shown in just 684 minutes of Bundesliga football for Borussia Dortmund, it’s clear to see just why he’s highly thought of. The ability to play in such an attacking team without the added pressure of the media, Sancho can showcase his abilities without the added unnecessary criticism. Like Ademola Lookman of RB Leipzig and Reece Oxford of Borussia Monchengladbach, Englishmen in German football is something that seems to be paying off. And therefore, it’s remarkable to see that Sancho hadn’t even been considered by Gareth Southgate for England’s World Cup squad. 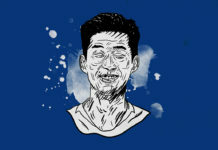 The Borussia Dortmund certainly offers something different and away from the norm we’ve seen the past couple of tournaments while his versatility would’ve been a bonus. If there’s anything to take away from this, it’s that Sancho is a frightening player to come up against, while the likely arrival of Lucien Favre will only further the career of this young Englishman. Regular TFA writer, lover of football analysis, follow me on Twitter.